The weather is turning and the back end of summer is almost ready to show itself. Your commercial roof had been subjected to the elements all summer and it is time to think about the upcoming winter. At S&S Roofing, we are your local commercial roofing installation, repair and maintenance leader. We want to remind you that the clock is ticking to have your flat roof maintained before the winter snows. Like a delicate caterpillar, your roof can emerge from the winter as a beautiful butterfly and more importantly, without any leaks. As amazing and convenient as a flat roof is, it is the most susceptible to leaks if not maintained. Leaks that can create very large problems for your business or organization. You see,flat roofs are not necessarily completely flat and without regular maintenance and professional installation the roof has a tendency to leak. These days, flat roofs have a pretty bad reputation for being the worst kind of roof that you can buy. Well that is basically what the kids are calling “Fake News”. Flat roofs are incredibly useful and provide hundreds of feet of usable space for controls, climate control systems and even storage if the proper rating allows. The problem with the typical flat roof is the installation. Many times, construction companies install roofs for commercial use and are not utilizing a crew of professional installers. Utilizing professionals to both install and maintain your flat roof is critical to the longevity and integrity of your building. The results of a professional, flat roof expert is truly a thing of beauty and might even bring a tear to your eye. Where does a professional commercial roof installation expert come from? That is a good question and we have done an extensive study as to what are the best qualities to have to be a commercial roofing professional. The Ability to Stand on Top of the World – OK, so maybe roofing is not standing on top of the world but roofing by nature is done at an elevated height. The potential for injury goes up once your feet leave the ground. Of course S&S Roofing is completely committed to safety and provides all of the necessary fall protection gear. We are committed to keeping our employees and customers safe. Just like everyone cannot be a rock climber, it takes someone comfortable with heights to be a commercial roofer. The Ability to Shrug Off Heat – Roofing can resemble the fires of hell. 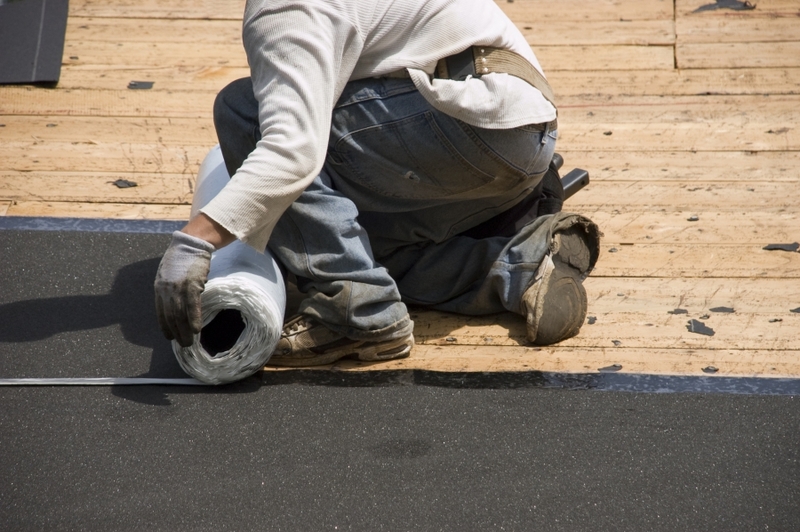 Many times the roofing material is black, which absorbs the sun and raises the temperature to blistering levels. Resurfacing a commercial roof is a process that includes hot tar, like the same stuff that the dinosaurs got stuck in in California. This is one of the reasons that so many roofing companies have difficulty providing an exceptional quality product, it takes a special person to be able to excel at such demanding work. Of course, that is precisely why S&S Roofing is a leading commercial roofer on the East Coast, we employ the best and provide the best results. The Ability to Perform Physically – Roofing is a tough job and that is putting it lightly. The physical demands are incredible, not only does the heat rob energy but physically working in these conditions can be dangerous in itself. Lifting and bending, hammering and cutting, roofing for a day is like doing one of those classes in which people think they are ninjas. Come to think of it that would be a great new workout: the roofers workout. You could complete obstacles while wearing a harness and carrying a 50 pound nail gun. Oh yeah, the room is 130 degrees. So as you can see, being a roofer is tough and the roofer must have a special skill set. At S&S Roofing we nurture the skills of our employees because ultimately, the quality of work they produce directly reflects our values. We have hundreds of satisfied customers around the region and it is due to the boots on the ground and the crews on the roof. So when your commercial flat roof needs attention, contact us here at S&S Roofing and let our crews go to work for you.